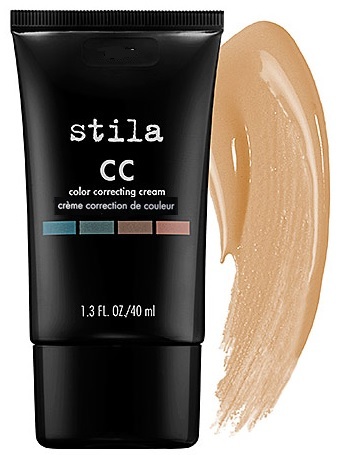 Stila CC Color Correcting Cream - 40ml - $57 - in 6 shades: Fair, Light, Tone, Medium, Warm and Tan - offers the ultimate in colour correction while creating a smooth, flawless, natural looking complexion. Bursting with revitalizing skincare benefits, it has a green based formula - to reduce the appearance of hyper-pigmentation and brighten skin; micro-encapsulated pigments- that colour corrects upon application to adapt to skin tone creating flawless, invisible coverage; hydra-extend technology - comprised of sugar molecules which provide up to 72 hours of continuous hydration; along with photonic crystal technology - which contains a colour corrector and an optically transparent polymer that helps soften the appearance of fine lines, wrinkles and other skin imperfections for a natural, youthful looking appearance. Unlike other colour adjusting products that I've used that never actually adjust themselves to be light enough for my skintone, this Stila one actually comes in enough of a shade selection that even fair skin can have a matched without getting that "dirty" tone that you end up with when products are just a touch too dark. Available now at Shoppers Drug Mart, Murale and Sephora stores across Canada.